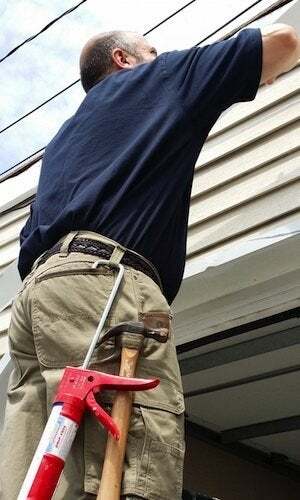 Setting out to make a repair on his roof, our blogger expected to use a handful of familiar, basic tools. By the end of the day, though, what had proved the most useful wasn't a tool at all! Look at any flat roof and, along the edges, you’re likely to see a special type of flashing—the drip edge. Though nothing more sophisticated than a profiled length of aluminum or galvanized steel, the drip edge performs a critical set of functions. For one, it closes up the space between the roof deck and fascia board, protecting the two components from the weather (and from each other). Second, the drip edge guards the roof deck from exposure to wind-driven rain. But most important, the drip edge, true to its name, encourages rain to shed outwards and away from the building, not down the side. Finally, although it’s primarily intended to prevent water damage, the drip edge provides a decorative bonus—it lends an attractive, finished appearance to the roof. How do you know if your drip edge has been doing its job? Check the fascia board, or in some cases, the underside of the roof overhang. Here, if you notice water stains, you can probably blame the drip edge. But stains are not the only sign of a drip-edge failure. As I discovered on a recent visit to my summer house, some signs are much more dramatic. As I pulled into the driveway, I didn’t see any water stains. No, what I saw was the drip-edge flashing hanging down the side of the garage, having become almost fully detached! My best guess was that high winds caused an outdoor cable to snag the flashing and wrench it out of position. I’m just glad I stopped by the house at the right time. Had I not been there to put the drip edge back into place, a leaking roof or a flooded basement—or both—may have been waiting for me on my next visit. Of course, I was on vacation and not eager to work on anything (other than my suntan, that is). 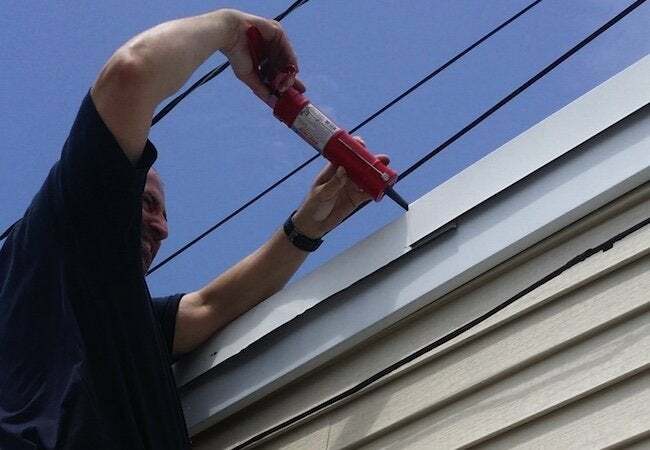 But knowing that, without the drip edge in place, the house would be vulnerable to damage from heavy summer rains, I had no choice but to move forward with the repair. Within minutes, I’d rounded up the basic tools I’d need. But as it was such an exceedingly hot day—and because I would be working with sharp-edged metal—I had to put extra thought into my choice of clothing. In my experience, when you’re tackling a tough task or working under difficult conditions, your gear can make or break your ability to perform. 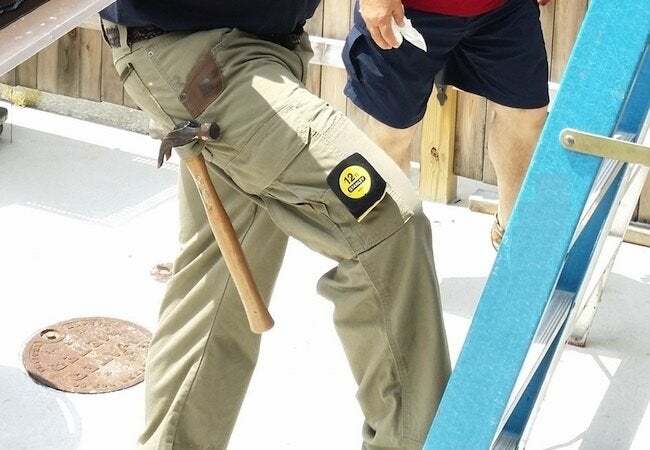 For that reason, I was happy to test a couple of pieces from the Wrangler® RIGGS Workwear® line—a collection designed specifically to provide durability and comfort on the job site. The Wrangler® RIGGS Workwear® collection includes everything from jeans and overalls to long-sleeve shirts and button-downs. Because I was facing an outdoor job—in summer, no less—I chose the Short Sleeve Pocket T-Shirt. Though I had read the label and understood the shirt is made entirely from seven-ounce cotton jersey, I was still surprised by the balance struck between its rugged construction and loose-but-not-too-loose fit. Aside from the vented taped side seams and taped neck seam, I also loved the tagless label, because when I’m on a ladder, the last thing I want to worry about is a scratchy collar. Along with the T-shirt, I wore the Ripstop Ranger Pant, named for the durable ripstop fabric that makes the garment not only extraordinarily tough, but also quite comfortable and, in my experience, miraculously breathable. Back to the job at hand: The initial step was to remove the damaged drip edge and closely inspect its condition. While the wind had done most of the work for me, taking down all but one portion of the flashing, there were still a few nails left to remove. Using pliers, I pulled out the nails, then carefully carried the drip edge down to the ground, where I had set up a rudimentary workbench. If the flashing had been irretrievably damaged, I could easily have gone out and purchased a replacement. After all, home centers typically stock drip-edge flashing in 10-foot sections, in multiple colors and in multiple profiles. But lucky for me, the damage was minimal. In relatively short order, I was able to smooth out the few dents simply by running a block of wood over the metal on both sides. In other words—so far, so good! Up to this point, what I loved most about Wrangler® RIGGS Workwear® wasn’t that it had resisted tears or allowed freedom of movement. It did do both of those things, but I was most impressed with the breast pocket of the T-shirt. Unlike most breast pockets, this one isn’t merely for show. On the contrary, the pocket was strong enough to hold the pair of pliers that I used on the roof. Plus, inside the pocket there’s a hidden utility loop—the perfect spot to stash a carpenter’s pencil. Those are the kinds of little details that mark the Short Sleeve Pocket T-Shirt as having been pragmatically designed with real working people in mind. Something else I liked: Despite the intense heat, I was managing to stay cool thanks to the vents that are let into the pant just below the reinforced knees. Certainly, the ripstop material is breathable on its own—more breathable than I expected—but the extra airflow goes a long way toward ensuring comfort. In the final phase of the flashing repair, I had to reinstall the drip edge. To keep it in place over the long haul, I ran a bead of roofing cement along the side that would sit against the roof deck. The cement would help the flashing withstand the next gust of wind or tug from a cable. Once I’d done that, there was only one step remaining—climbing the ladder and repositioning the drip edge. Under normal circumstances, I would have expected to make a few trips up and down the ladder, but here’s where the many thoughtful, practical details in the design of the Ripstop Ranger Pant really surprised me. In the end, I had to make only one trip, because everything I needed to complete the project fit handily on the garment. On the right side, a loop provided a place to hang my hammer. A smaller pocket proved to be the exact right size for a tape measure. With my caulking gun secured in one of the belt loops, I jammed a handful of nails into the cargo pocket, confident that their sharp points would not poke through. Atop the ladder, I completed the rest of the work pretty quickly, securing the flashing with roofing nails at intervals of about three inches. Then, to finish the job, I ran a second line of roofing cement, this time along the seam where the flashing came into contact with the roof. At any point in the process, the clothes I was wearing could have slowed me down—or simply made the project more of a pain. It’s happened before. But if anything, wearing Wrangler® RIGGS Workwear® helped me take the job from to-do to done faster than I anticipated, with plenty of time left over in the afternoon to enjoy the nearby beach. Best of all, I know that if I’d encountered any problem at all with my clothing, it wouldn’t have been a problem for very long. That’s because the full line of Wrangler® RIGGS Workwear® comes protected by a lifetime warranty. OK, seriously, how many T-shirts or pairs of pants do you own that are covered by a warranty? That’s what I thought. This is a sponsored conversation written by me on behalf of Wrangler. The opinions and text are all mine.